The last two months before the exam is extremely crucial for CLAT aspirants who have been preparing for months and years. A majority of students in India who attempt the CLAT take a long time to prepare themselves for this most coveted exam. Among them are also those who were unable to succeed in CLAT exams earlier. However, a considerable number of these students choose to study on their own. Some are working professionals, while others are dedicated to CLAT Preparation only. For these aspirants, the biggest source of knowledge is the digital world. This is why a leading law entrance coaching institute, The Opus Way has CLAT Coaching available in long-distance study models. The aim of this model is to reach to those who are not able to attend classroom teachings and prefer flexible timing for study. One such useful module is the CLAT crash course by Opus. By opting for this course, the aspirants can accelerate their CLAT preparation by means of carefully devised mock test series that would contain all probable question patterns that are likely to come in the exam. This study module which has the duration of 1 month is extremely fruitful for aspirants who were until now confused with time management strategies. In the final hours before the exam which will be held on 13th May 2018, they can have a thorough revision of the concepts and also learn a few shortcut techniques. They will also be receiving mentor books, live workshop opportunities, study materials, full-length mocks and lots of useful tips which will prove to be a tremendous boost to their CLAT preparation. 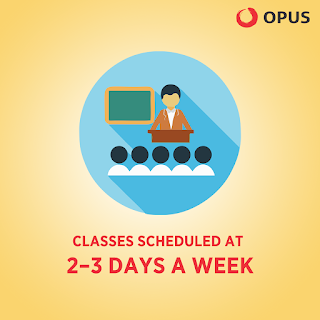 Thus, by the time of the exam, the aspirants will be completely ready with the help of CLAT experts of The Opus Way. The scenario is a bit different with aspirants who are associated with any good law entrance coaching institute for their CLAT preparation. The key features of the 1-month CLAT crash course of The Opus Way include- 35 full-length mock test papers, unlimited resources, 10,000+ questions and answers with explanatory analysis, mentor books and classroom teachings 6 days a week. This crash course is the right solution for students who need last minute guidance. It is also helpful for those who have recently started their CLAT preparation. - A student must devote quality time, preferably two to three hours every day for knowing gathering, interpreting and revising all law-related news as well as current affairs. - Their CLAT preparation schedule must include a mandatory revision session and mock-solving. Analysis of the answer keys is crucial. - Time management must be vigorously practiced. - Most importantly, students must balance their studying and relaxing periods, so as not to end up with a weary body and a fatigued mind on the day of the exam.